The Bf-109F series was probably the ultimate 109. It had an increase in power over the E series with its later DB 601 engine. It had an increased armament that consisted of two nose mounted machine guns and a 20mm cannon. It also had a refined airframe with much better aerodynamics and there were not any heavy guns in the wings as with the earlier variants so it had somewhat greater maneuverability, at least in a roll. Later versions were weighed down with more equipment, more guns and while they were faster in a straight line, they were sluggish when it came to tossing them about the sky. First brought out in late 1940, the F was found in all theaters of operation in 1941 until gradually supplanted by the G model. Though several 109Gs and an E or two survive, to my knowledge, no Bf-109F is still extant (though I'm sure that readers will correct me if I'm mistaken). I was with much delight when I heard about the Fine Molds F kits. One thing that 1/72 modelers have never had is a decent F variant. I don't know why, but there it is. I was taken aback a tad when I heard the MSRP, but when one wants something bad enough, one will pay. The kit itself comes on two major and several minor sprues. The fuselage halves and cowling covers are on one sprue, the majority of the airframe is on the other, while the prop, supercharger intake, and lower cowling are on separate sprues. This allows Fine Molds to do a variety of F and G variations without giving the modeler any spare parts! 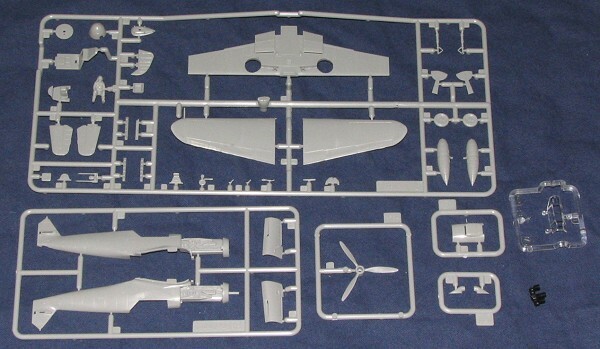 The small clear sprue contains the one-piece canopy and the gunsight. There is some detail on the cockpit sidewalls, but it is a bit shallow. Cockpit components are basically a floor, seat pan, control stick and instrument panel. A Decal is provided for the panel as is a pilot figure. The really neat addition is the engine that is molded as part of the fuselage halves. While not that detailed, it does provide a basis for those who want to add to it. Having the separate upper cowling halves is a bonus as it allows the engine to be displayed should one want. The rest of the kit is pretty standard with no other additions other than a drop tank and rack. I should point out that the folks at Fine Molds have ensured that this is a bonafide F-4 with the proper wheels, prop, and detailing; including the aft fuselage braces. Instructions look somewhat like those for a Hasegawa kit, though most of the wording is in Japanese. A paint chart is provided with Gunze, Tamiya and some other brand that I don't recognize. RLM shades are also included. There are markings for one aircraft as shown on the box art. What really stands out is that Fine Molds doesn't want you do do any fancy painting and the camouflage is provided as decals. All you have to do is paint the underside with RLM 76, the lower wing tips and cowling with RLM 04 and then start applying the decals. 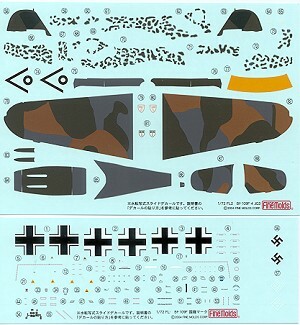 A sequence guide is given and it seems that one does the camo markings first and then applies the stencils and insignia. It will be quite interesting to see how this all works out and whether the decals can stand up to setting solutions or not. I'm looking forward to giving this a go. It looks no more complicated than the Hasegawa or Academy 109G kits and the addition of the camo as decals seems to be part of a trend in modeling. Review kit courtesy of .